Do you want to keep tabs on your mischievous dog every time you leave home? Or would you like to add some extra muscle to your existing home security cameras? Or maybe you are simply in the market to check if your teens already got home before their curfew? The Wi-Fi enabled Nest Cam Security Camera, formerly Dropcam, is the best home surveillance system you can get for your home. The Nest Cam is the official replacement of Dropcam Pro, rising to become the Nest family’s head of cameras. Technology lovers highly anticipated its launch everywhere. They were excited to twiddle their thumbs and thinking of all the goodness that the merger or Dropcam, Nest and Google have resulted to. It is very understandable that expectations were set too high. What are its features? What can it do? Is it better than Dropcam or was it a downgrade? As we mentioned, Dropcam was a major competitor to Nest when it came to smart home devices. Nest eventually bought Dropcam for $555 million, so they were obviously doing something right. While Dropcam no longer exists as a standalone company, you can still buy the original Dropcam wireless camera from Amazon. The Nest Indoor Cam is a continuation of the Dropcam line of cameras, but it’s work looking at a comparison. Whom Is Nest Cam Security Camera Designed For? Homeowners who spend time away from their home and want to monitor the property. The Nest Cam Security System offers 24/7 live video. This also boasts of an easy and quick setup and excellent picture quality. There is also a two-way communication to allow you to talk and listen to the other end of the line. Cloud recording and remote monitoring are also both available. At a viewing angle of 130 degrees, you can see and check the whole room at a high definition 1080p whether it is day or night. The live video recording that is available 24 hours a day, 7 days a week can give you the ultimate peace of mind that you need. You can easily install the Nest Cam Security camera wherever you want and download the Nest app to formally get started. There is no need for any hub. In a matter of minutes, your surveillance system will already be up and running. The Nest Cam carries a 1/3’ sensor which can record excellent 720p HD video. Its lens can capture great color range and details. The night vision capacity is also very powerful. Many of this camera’s technical aspects are really impressive. However, it is the picture quality that makes it one of the best security cameras for home today. Nest Cam will let you communicate through its camera alone. It has a good audio function. You can listen, give instructions have conversations or calm your agitated pet. With this camera, you can have your home right in your home as you can get sound and motion alerts and talk back to get a person’s attention. Although you can easily access the live images free from any of your devices, there is still a need for you to subscribe to Nest App to make use of its recording features. The monthly fees start at a set price with some great discounts if you add more cameras. Without a doubt, recording is what makes this camera even more useful even though by far, this is not yet a necessity. You can easily access the camera through your phone or a web browser no matter where you might be in the world. While the default of the camera is set to private, still, you have the option to share the steam with your friends or make this public and show it to the rest of the world. Question: If you like to record videos, do you need to buy Nest subscription or can you pair this with Amazon Cloud and integrate video storage this way? Answer: You need to get Nest subscription. Question: Can this be used as baby monitor? When you are asleep and your baby starts to cry, will it automatically play the audio for you on your phone or just an alert? Answer: This is possible if the system works. Question: Is Nest Cam compatible with other hubs and devices? Answer: No, you cannot save anything. Question: Will video record even if there is no WiFi? Will the device store recordings that you can upload to the Cloud later on? Answer: Sadly, both a No. As the camera needs to be plugged to a wall outlet, not to mention that this has large lens, it can be hard to hide Nest Cam Security Camera. However, there is a company that specializes in hiding Nest Cam where you can use their accessories such as tissue box, alarm clock, plant, teddy bear and more. There are plenty of options that will surely amaze you. Nest Cam Indoor security camera is the best home surveillance system that offers usability and easy setup. The wide angle lens of the camera and its crystal clear 1080p resolution are guaranteed high definition, with unbeatable night vision. Thanks to its clear video, easy setup and seamless integration with the rest of the smart home products. 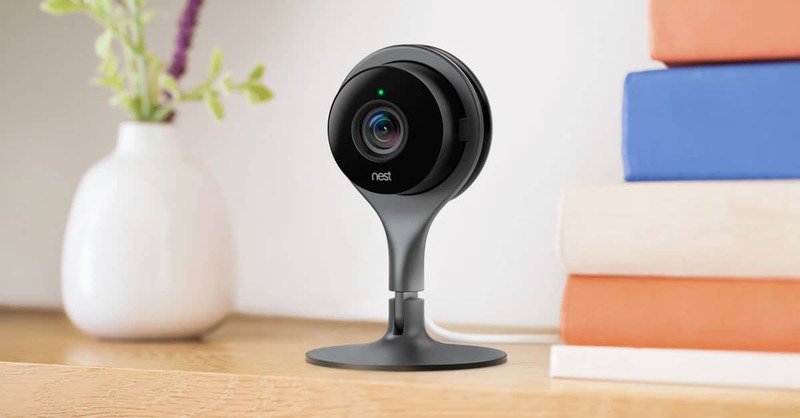 It’s no surprise the Nest Cam Indoor Security Camera was rated one of our top picks in our guide to the best home security camera systems.